Available solely in two gasoline powered derivatives, the BMW 2 Series Convertible can be had in both rear and xDrive all-wheel drive variants. The 230i features a 2.0-liter turbocharged 4 cylinder with 248 horsepower, te only gearbox choice being an 8-speed automatic. The M240i features a 3.0-liter turbo 6 cylinder with 335hp that can be paired with either the 8-speed auto, or a 6-speed manual. 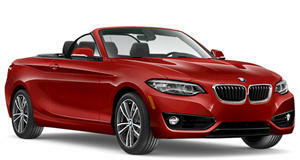 The optional $500 Driving Assistance Package includes speed limit info, lane departure warning, city collision mitigation, and frontal collision warning, making the 2 Series Convertible an IIHS Top Safety Pick +. After the BMW E46 3 Series, few BMW’s have captured the same spirit of involvement paired with nimble dynamics and exceptional power to weight. There have been good, even great BMWs since, but the 2 Series is the model that gets closest to that ethos. The convertible trades some of that for lifestyle appeal though, with a power retractable soft-top roof adding weight to the fray. Now post-LCI (Life Cycle Impulse – BMW speak for a mid-life refresh), the 2 Series Convertible features new engines and revised interior styling, but it’s still a simple, enjoyable convertible coupe – the best kind BMW produces. For 2018, the 2 Series takes on a range of interior updates. The dash has been completely redesigned, now featuring panel inserts in varying finishes. The dash is now more cohesive, but still features a familiar BMW design. The center console now features high gloss black plastic, and a sliding cover for the cup holders is standard trim. The crucial upgrade is iDrive 6.0, featuring a standard 6.6-inch screen and the standard rotary controller – but the screen can also be touch operated, finally! An optional 8.8-inch screen is also available with the new system. Ergonomics feel on point in the 2 Series, which will seat four – though the rear pair suffers from cramped leg room, and with the roof up, tight head room. Push a button, wait 22 seconds, and head room is no longer an issue. The retractable soft top stows out of sight, only compromising cargo volume minimally. The rear seats still fold. The 2 Series nails the ethos of the old E46 3 Series. Compact and nimble, it offers positive handling and an exploitable chassis. 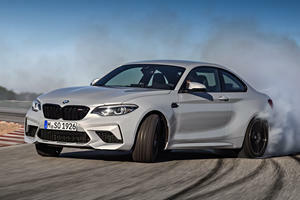 The front end might not have the same keenness, especially in M240i guise with a heavier engine, but the 230i has a light, sharp turn in with keen levels of grip. Rear end grip is similarly eager, though with the convertible’s softer nature and weaker shell, there’s more flex, and overall more understeer. You can push through that, though, and there’s exploitable oversteer available – if you’re looking for it. The 2 Series maintains a positive connection with the road, and a pliant ride. It errs on the firmer side of things – particularly with the M Sport package’s suspension, but even the standard model is fairly firm. It offers greater comfort than a Mercedes CLA, though less than an Audi A3 – but it’s more enjoyable and engaging than both. On US soil, there are but two engine choices available. The 230i features a 2.0-liter turbocharged 4 cylinder with 248 horsepower and 258 lb-ft of torque. The M240i is the only sub-M2 2 Series to get a 6-cylinder – a 3.0-liter turbo motor with 335hp and 369 lb-ft. Both models are standard as rear drive, but xDrive AWD can be specified. The 230i is exclusively available with an 8-speed automatic – the standard ‘box on the M240i too – but the semi-M model can be had with a 6-speed manual too. The auto is the sweeter, smoother, more appropriate gearbox, though. Among the 2 Series Convertible’s standard kit, you’ll get LED lights, a reverse camera, and automatic climate control. The 230i can be had as a blank canvas, or in 2 tiers, Convenience and Premium – the former featuring auto-dimming rear-view mirrors, keyless entry, and ambient lighting, and the latter adding a heated steering wheel, heated seats, and navigation with real-time traffic information. The M240i comes as is, in M-Sport trim as standard, but the Premium tier equipment is available as an option pack. The 2 Convertible hasn’t been crash tested, but the coupe on which it’s based is a 2017 IIHS Top Safety Pick +. Though the 230i might be the keener driver’s car – even sans 6-cylinder – the M240i convertible in rear-wheel drive, with an auto ‘box is the pick of the 2 Convertible range. 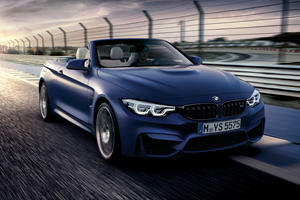 It bears a characterful engine and potent power, and the compromised handling is more acceptable in convertible guise. New exterior color and leather options have been added for the new BMW 8 Series. 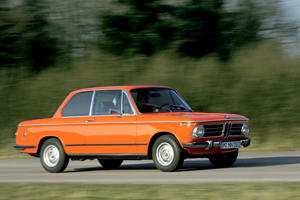 The retro design looks superb on the baby Bimmer. Two things: Yes, there will be a new 2 Series and it will be RWD.